State Bank of Pakistan’s (SBP) ‘Refinancing Facility for Modernization of Small and Medium Enterprises (SMEs)’ is for purchase of new/imported plant & machinery for BMR of existing SME units and/or setting up of new units. Financing for purchase of new generators up to a maximum capacity of 500 KVA is also available under this scheme. However, the capacity of generator shall not be in excess of SME Unit’s in-house energy requirements or up to 500 KVA, whichever is less. Financing up to Rs. 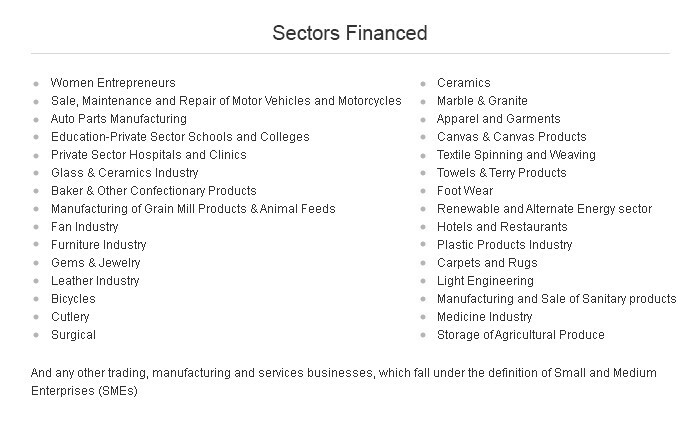 100 Million is available to wide range of SME clusters/ sectors such as (i) Rice Husking, (ii) Cotton Ginning, (iii) Power Looms, (iv) Dairy & Livestock, (v) Cutlery & Stainless Utensils, (vi) Surgical Instruments, (vii) Marble & Granite, (viii) Engineering Goods (Electronics), (ix) Fisheries, (x) Packaging/ Processing of Fruits/ Vegetables, (xi) Furniture, (xii) Gems & Jewellery, (xiii) Sports Goods, (xiv) Agro-based Industry. Repayments through equal quarterly/half yearly installments.